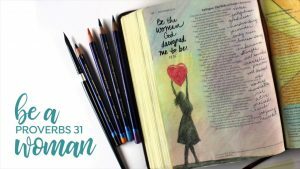 Dive deeper into your journey in Bible journaling with video tutorials! 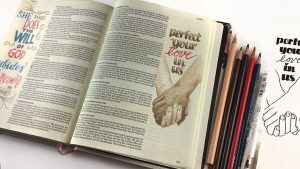 Learn the application of color and techniques to create effects directly from the author. The videos below are a selection of her videos on YouTube; you can sort videos by the tags above the gallery, or click on any thumbnail to make it large and play the video. 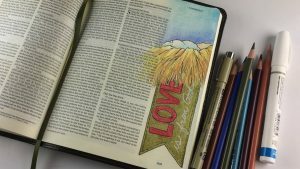 At right is a little lettering celebrating Bible Journaling Made Simple as a ministry tool in the author’s life! 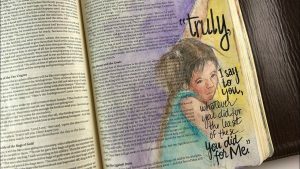 Page uses simple watercolor, and a brush! 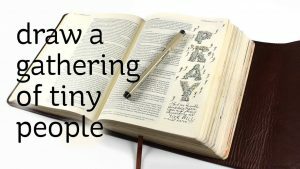 The author posts weekly videos on almost every Sunday – you can subscribe to her YouTube channel. 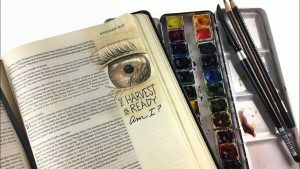 Author Sandy Allnock is an artist, crafter, and Bible journaler living in Washington State. She’s a dog mom, loves chocolate, and watches way too many worship videos on YouTube!. 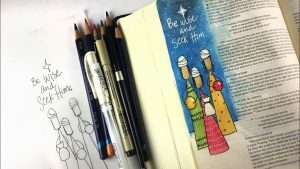 Visit her blog and crafty YouTube channel, chase her down on Instagram, and join her Facebook Group for Bible Journaling Made Simple. Copyright ©2018 Sandy Allnock LLC. All rights reserved.